Within this small article, I am reviewing how the Euler formula for closed polyhedra can be used to efficiently analyze the topology of a 3D mesh, in order to detect its genus. 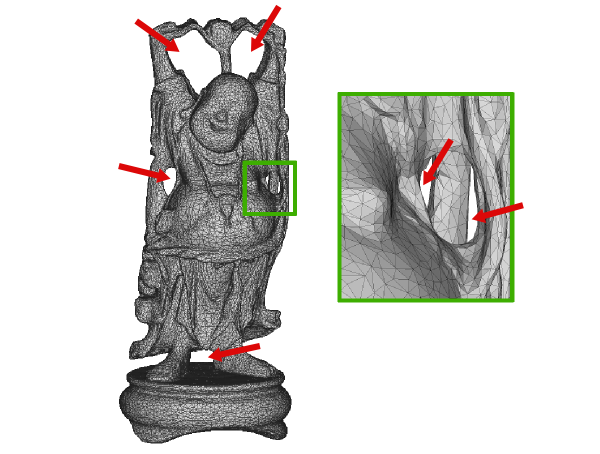 This is useful in the context of some geometry processing applications, like UV unwrapping. This number is always two for convex polyhedra, which is a very interesting and useful property. We'll come to more complicated cases later, for now let's just check the result for a simple example: a tetrahedron. The tetrahedron consists of four vertices, so V=4. It also consists of four faces, so F=4. Finally, there are three edges for the bottom triangle, plus another three originating at the bottom triangle's corners (all meeting at the tip), which makes six edges in total, so E=6. Plugging these numbers into the formula gives us V + F - E = 4 + 4 - 6 = 2. This is the expected result, and the same holds for all other convex polyhedra (if you are looking for a mathematical proof, there is a list of 20 different proofs by David Eppstein). This is a neat property - we can use the formula to compute the number of edges of a closed convex polyhedron, for instance, just by knowing the number of vertices and faces. 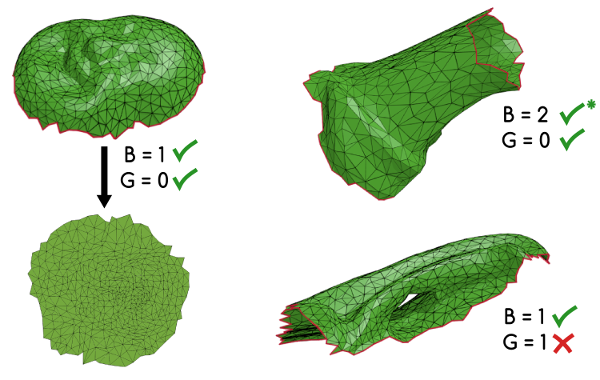 One can also show that retesselation or subdivision of the mesh does not change the result (the Euler characteristic). For example, when subdividing a quad into two triangles, we will add one more face, but also one more edge - that means F and E both become one larger, which means the differences cancel out in the formula above, so the result will remain the same. 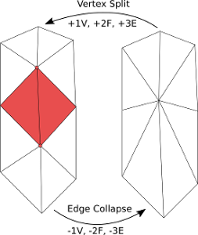 To give another example: If we perform an edge collapse on a triangle mesh, this operation will remove two triangles and one vertex, but also add three edges - the euler characteristic remains the same (the same holds for the inverse operation, a vertex split). 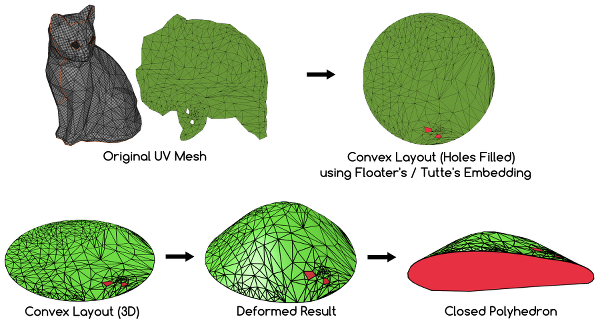 Therefore, unless we really change the topology, the Euler characteristic of a manifold mesh doesn't change between a simple varaint and a high-resolution version obtained through vertex splits or subdivision methods. Closing a hole to obtain a watertight convex polyhedron. A UV layout interpreted as a closed, convex 3D polyhedron with a Euler characteristic of two. The 2D UV mesh of the cat model has a number V=372 vertices, F=662 faces and E=1035 edges. If we add B=3 to account for the boundary loops, we obtain 372 + 662 - 1035 + 3 = 2, which is the expected result for the closed, convex polhedron. This way of analyzing a mesh comes in handy if we want to check if we can actually unwrap a 3D mesh or not, as we will see in the next section. 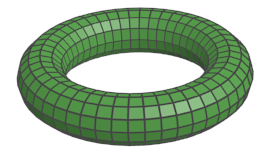 A torus (genus of one and zero Euler characteristic). Now, there are polyhedra which are not convex, and that applies to most real-world 3D meshes that we are dealing with in graphics. When computing the Euler characteristic for a certain kind of non-convex meshes, the result will be different from two. More specifically, the Euler characteristic is related to the genus of the 3D mesh. The genus is a topological measure telling us how many topological holes, or how many topological "handles" a 3D mesh has. The most simple example for a mesh with a topological hole / handle would be a donut, or, more formally speaking, a torus. As you can see on the example image, the torus has a topological hole (being "the middle of the ring", if you will). It therefore has a genus of one. At the same time, it doesn't have anything we would maybe otherwise call a "hole in the mesh": unlike the cat mesh that had holes in the surface, the 3D surface of the torus is still closed, or, in other words: it's still a watertight polyhedron. A large mesh with genus 6. Plugging these values into the formula above results in 24960 + 49940 - 74910 + 0 = 2 - 2 * 6 = -10. The formula holds - pretty cool, isn't it? Exploiting this new knowledge, we can solve for G to compute the genus if we already have V, F, E and B! Checking if a 3D surface patch can be unwrapped. Required are at least one boundary loop and zero genus. The patch on the left can be unwrapped, as it fulfills the requirements for "disc topology": a single boundary loop and zero genus. The patch on the upper right can be unwrapped as well, but depending on the algorithm to be used we may need to have exactly one boundary loop (disc topology), which we can obtain by temporarily filling one of the holes or, alternatively, by connecting them by a cut. The patch shown on the lower right can't be unwrapped, as it doesn't have zero genus (which could be fixed by introducing additional cuts). This is, of course, just a simple example, and there are probably many more interesting geometry processing applications where this kind of genus detection can be applied. If you made it until here - congratulations ;-) I hope you liked my article - as always, if you have any feedback, corrections or additions that you would like to share with me, feel free to write me an email, or just comment in the respective twitter thread.